With beautiful earth colors, rich woods and unique details, Southwestern style furniture looks wonderful whether you decorate an entire room or add one special piece. What Is Southwestern Style Furniture? When you think of Southwestern furniture, do you picture Aztec or Indian designs, rustic hand hewn log furniture or oversized pieces with Old World charm? If you imagined any of these furniture styles, you are correct as each one is part of the unique styles that make up the furniture designs of the Southwest. The highly skilled craftsmen of the Southwest typically learn their craft from their fathers and grandfathers as the woodworking skills are handed down from generation to generation. Another style of Southwestern furniture that is often handcrafted are the beautiful pieces made of leather, animal skins and pigskin, called equipale. While many online retailers offer a variety of different kinds and styles of Southwest furniture pieces, some companies specialize in one type of item such as Southwestern home office furniture or living room furnishings. Still others carry only one style of furniture such as rustic log furniture or Mission style pieces. The following is only a small sampling of the many online retailers offering Southwest furniture styles. 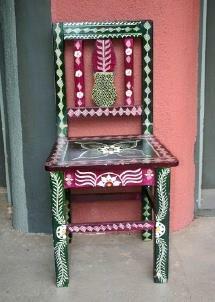 Southwest Interiors also carries a line of exquisite cactus furniture. Cactus furniture is made of a combination of insigne pine that is kiln dried and inlaid with polished planks of Quisco cactus. The unique look of the cactus wood is intensified by its beautiful color tones against the natural color of the pine. All of the pieces are finished with a polyurethane coating. Southwestern style furniture is a unique and beautiful blend of the simplistic clean lines of the rustic furniture of the pioneers, the influences of Native American and Mexican cultures and the elegant and ornate styles of Old World Spain.